Looking for a new Mediterranean diet recipe? 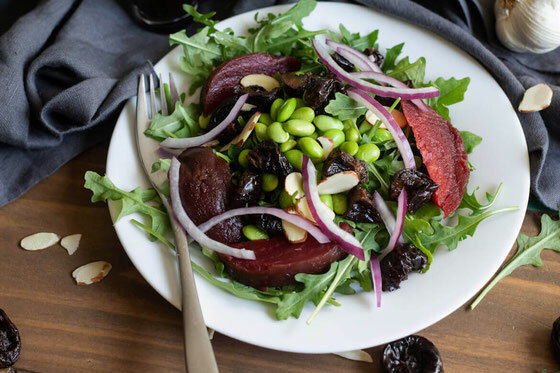 Whether you’re a newbie to this eating plan or are a long-time follower looking to mix things up, you’ll love this Vegan Mediterranean Prune Salad with Beets, Almonds, and Edamame! It really highlights how good it tastes and feels to eat the rainbow—and why doing so is essential for good nutrition and health. By this time of the year, you’ve probably seen story after story in the news about different types of diets promising to help your health and make you feel good. While I can’t speak for all of them—and there are definitely ones I’d dismiss super quickly!—there is one I wholeheartedly recommend you pay attention to. This is the Mediterranean diet. This type of eating style provides a refreshingly balanced way of eating that has stood the test of time. And this year it totally came back to the top of the diet list when it was named a top diet by U.S. News & World Report. So what exactly is the Mediterranean diet? It’s an eating plan, rather than a structured diet, which gives you the freedom to cook your own recipes as well as to go out to eat as you wish. The Mediterranean diet has been connected with weight loss, as well healthier cholesterol levels, and a lower risk of heart disease and diabetes. The eating style focuses on taking in ample amounts of important nutrients, including fiber. If you were wondering, women ages 19 to 30 should get 28 grams of fiber a day, while women ages 31 to 50 should get 31 grams daily, and women 51 and older should aim for at least 22 grams per day. Men require a little more: 34 grams a day for ages 19 to 30, 31 grams daily for ages 31 to 50, and 28 grams per day for ages 51 and up. The star of this recipe is prunes, an ingredient I also love to snack on. 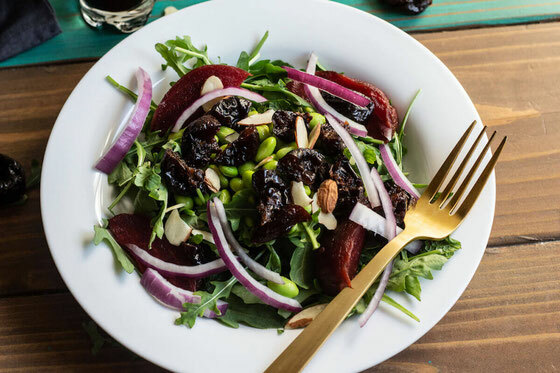 Each serving of the salad provides five prunes, the amount that research shows may help prevent bone loss when eaten on a daily basis. A serving of prunes is a good source of fiber, providing 3 grams. The prune juice is another good source of fiber, also offering 3 grams per one-cup serving. Fiber is important for the health of the microbiome—the part of your body that’s made up of beneficial bacteria. The prunes and prune juice also supply many vitamins and minerals, including potassium, riboflavin, copper, niacin, and vitamin B6, that help keep your digestive and bone health in tip-top shape. 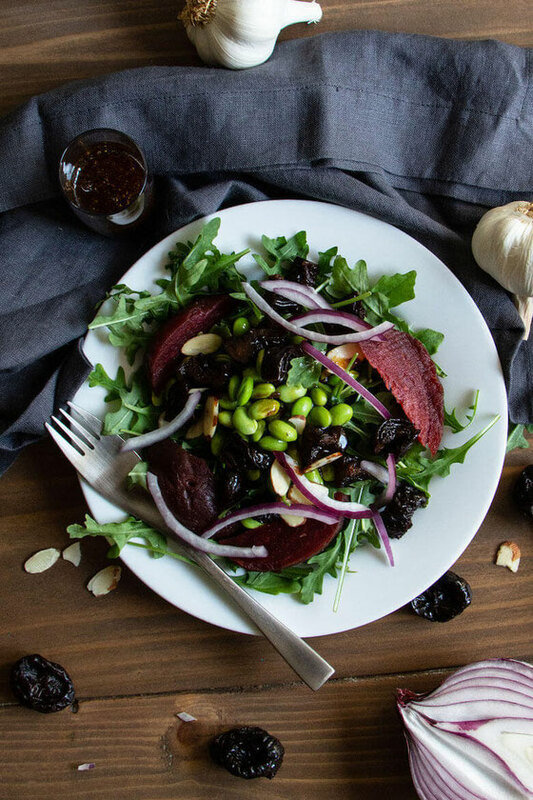 One of the main concepts of the Mediterranean diet is to eat the rainbow for a variety of vitamins, minerals, and antioxidants—and this is why I included the garlic, arugula, beets, and red onion. The Mediterranean diet promotes eating a variety of plant-based proteins, including beans and legumes. As a vegetarian, I rely a lot on these foods in my own diet, and edamame is an excellent source of protein. And it takes just minutes to prepare! One of the main teachings of the Mediterranean diet is that healthy fats are, well, healthy. Those monounsaturated fats, or MUFAs, in olive oil and almonds? They not only help keep you fuller for longer but also benefit heart health. If you want an extra hearty meal, serve this salad on a base of whole grains, such as quinoa, couscous, barley, or brown rice. Whole grains offer beneficial fiber, as well as a variety of other important nutrients. You’ll see that many Mediterranean diet recipes are seasoned naturally with low-calorie but flavor-packed spices, herbs, and seasonings. The balsamic vinegar, black pepper, parsley, and mint make this meal even more mouthwatering. I’ve shared what I do to feel good, and now it’s your turn! From now through March 15, speak out about your self-care routine on social media with the hashtags #ToFeelGood and #Sweeps. Sunsweet will make a $1 donation to the National Osteoporosis Foundation for every person who shares his or her experience on Facebook or Instagram! And by entering, you’ll score a chance to win awesome prizes—including $1,000 in cash and a year’s supply of Sunsweet products! You can post about your feel-good routine on Facebook or Instagram, using #ToFeelGood #Sweeps—or you can enter directly here. For ideas on what to post about, check out inspo in my recent blog post about how I snack to feel good. Add garlic and prune juice to a small sauté pan; cook over medium-high heat. Stir occasionally until mixture begins to reduce; stir frequently until semi reduced, about 7 to 8 minutes. Pour mixture into a small bowl, and combine with vinegar, olive oil, pepper, and salt; whisk and set aside. In a medium bowl, toss arugula, parsley, and mint together. 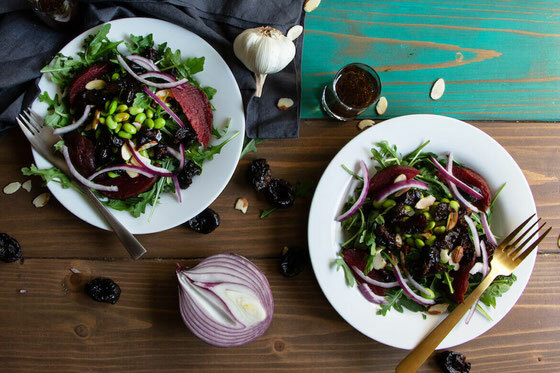 Plate salads with greens mixture, topping with beets, edamame, prunes, almonds, and red onion. Toss with dressing. Makes 2 servings. I’d love for you to sound off! What Mediterranean-inspired meals are you loving right now? 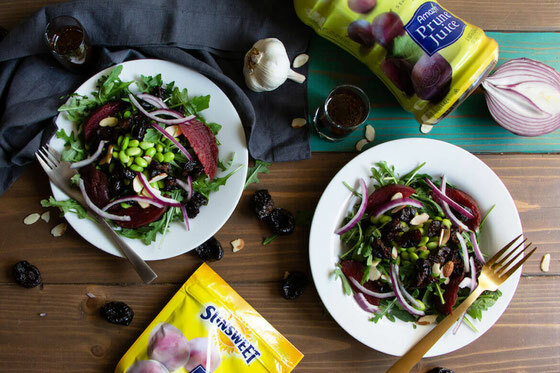 What are your creative ways to cook with prunes?